New technologies are impacting the way people travel at an ever-increasing pace. In order to shape the future we envision in this area, innovation must help create better transport experiences, guided by a more humane and sustainable approach. We now have the opportunity to create new mobility systems that can transform our needs and dreams into truly meaningful experiences. Questto|Nó is an innovation and design consultancy that was born in São Paulo and has already expanded to two other cities: New York and Rio de Janeiro. In 24 years of activity, we have already developed new cars, motorcycles, boats and even trucks. Each of these experiences has made us aficionados of mobility, and that is why we are so fond of creating and designing new transportation systems that can transform people’s experience today and in the future. Keeping an eye on the transition emerging in some of the great metropolises of the world, Questto|Nó’s teams in São Paulo and New York have joined efforts to create an integrated system of mobility that allows the coexistence of autonomous vehicles, conventional cars and other modes of transportation. How will the transition to the age of autonomous cars come about? Only 2 or 3 years ago, people thought autonomous cars would only exist in the distant future or in science fiction movies. Now we know that it is only a matter of time: they will soon be everywhere. Google, Uber, Tesla and several other automakers apply tests and minor updates on their technology every day, rapidly bringing us closer to the new era. Collective transport has advantages and disadvantages in comparison with individual transport. Individual transport is less efficient in terms of energy optimization, but it allows people to have more freedom in choosing their final destination. In contrast, public transport is more sustainable but allows for less flexibility when going from point A directly to point B. We are looking for a way to balance the advantages of both transport systems in a single solution. Do we need major changes in infrastructure? People often think that major infrastructure changes will be required in order to implement a new system in which autonomous cars can achieve their maximum efficiency. We conceived a low cost scenario that optimizes the city’s existing infrastructure and allows the autonomous system to reach its maximum efficiency. Digital Rails is a network of roads dedicated to autonomous cars and orchestrated virtually through an open data system. This platform coordinates intelligent traffic lights and stand-alone vehicles so that passengers will always have an express route that never stops, while allowing autonomous and non-autonomous vehicles to coexist side by side. Digital Rails relies on systemic logic that combines governmental and industrial initiatives. The government is the main agent of transformation, responsible for determining which roads will receive Digital Rails and applying the virtual and structural elements that allow its operation. Meanwhile, the automaker’s mission is to develop a variety of autonomous vehicles that meet Digital Rails’ dimensional and technical specifications for the inclusion of new vehicles. How do Digital Rails work? The current logic of operation, where cars are prioritized to the detriment of traffic lights, is more prone to delays in traffic, because of the unpredictability of the human factor. The Digital Rails system reverses this order, considering the opening and closing times of intelligent traffic lights as fixed data, which determines the pace of cars. In contrast, it considers three variables related to convoys –speed, length and the distance between different convoys – in order to determine the position and route of the vehicles. This system requires only one exclusive lane for autonomous vehicles, which eliminates the need for a complex infrastructure, dramatically reducing the costs of implementing Digital Rails. To maintain a balanced flow of vehicles, the exclusive lanes are spread over roads with heavier traffic and primary roads of the city. The express lane on the left is exclusive for convoys of autonomous cars. The other lanes are shared by both non-autonomous and autonomous vehicles that are not inserted in an express convoy. The exclusive lanes have the same width as the shared ones, but they are able to accommodate two rows of smaller autonomous vehicles, reserving a transition area that allows for efficient and safe convoy formation. Convoys formed in the exclusive lanes are reactive to the pulse determined by the data system, which determines their speed. The vehicles in the convoys navigate on the green waves, speeding up the journey of the passengers who choose the Digital Rails. The data system calculates the fastest route and determines the right time and speed for the cars to insert themselves into a convoy, connecting to Digital Rails on the left side of the exclusive lanes. A system that provides more efficient deliveries, more rapid response to health emergencies, optimized collection, convenient transport around the city for everyone. 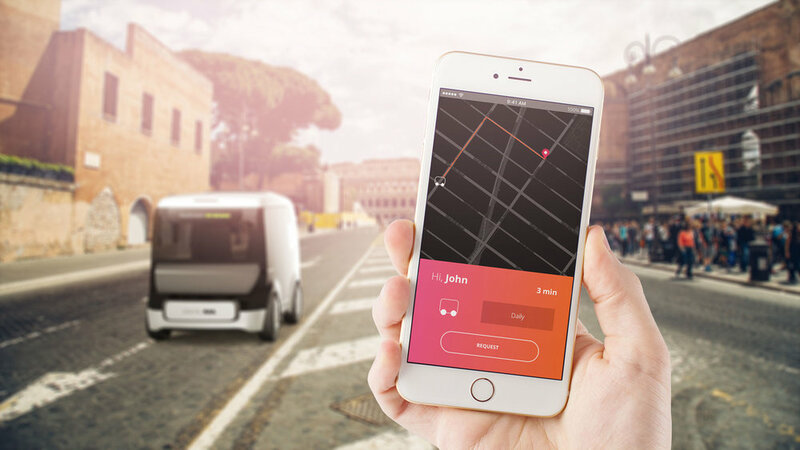 Digital Rails is a platform that enables the use of autonomous vehicles for different purposes, making the city more intelligent and sustainable. Technologies that make everyday life simpler and more practical. At the touch of a button, you can move anywhere quickly and efficiently.